It is now a part of the PGA Tour's Tournament Players Club (TPC) network of courses, following an agreement between the tour and the city that was announced on November 3, 2010. 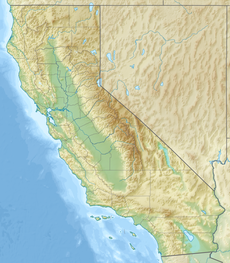 It is located in the southwest area of San Francisco, on the west side of San Francisco State University, and surrounded by Lake Merced on its other three sides. The entrance is at Harding Road, which connects to Skyline Boulevard on the east. Harding Park Golf Course opened 94 years ago on July 18, 1925. It is named after President Warren G. Harding, an avid golfer, who had died in office while visiting San Francisco two years earlier. The course covers 163-acre (0.66 km2) along the shores of Lake Merced, in the city's southwest corner. Willie Watson and Sam Whiting, who also designed the nearby Olympic Club's Lake Course, drew up a design plan for a course at Harding Park for a price of $300. The golf course quickly attracted national attention when it hosted a number of important tournaments, including The U.S. Amateur Public Links Championship in 1937 and again in 1956. Future PGA Tour members such as Ken Venturi, Johnny Miller, and Michael Allen frequented the course during their junior years, developing their games in the challenging conditions. In the 1960s, Harding Park became a regular stop for the PGA Tour, and produced many big-name winners, including Venturi, Gary Player, and Billy Casper. But by the end of the decade, after the San Francisco Open Invitational in 1969, the PGA Tour left Harding Park, due to deteriorating conditions and antiquated facilities. Course conditions worsened during the 1970s and 1980s, as the city budget cuts wreaked havoc on course maintenance. The low point came in 1998, when Harding was used as a parking lot during the U.S. Open at the nearby Lake Course of the Olympic Club. Finally, a turning point for the course came when Sandy Tatum, a prominent San Francisco attorney, champion golfer, and former United States Golf Association president, led the crusade to restore Harding Park to its former glory. He eventually got approval from former mayor Willie Brown to allow Arnold Palmer Golf Management, a Florida-based company, to renovate and operate the park. In 2001, however, the San Francisco Board of Supervisors, namely former District 7 Supervisor Tony Hall, opposed the project based on fear that Arnold Palmer's involvement in the project represented privatization of a municipally-owned golf course. As opposition grew, Arnold Palmer backed out, primarily over concern about revenue estimates. Palmer Golf and the city could not agree on a greens fee schedule. The city's proposed management contract, at the urging of the Harding Park Men's Club, specified a percentage of tee times that would be held for city residents at a greatly reduced rate, albeit an increase over the previous rate. When all hopes to renovate Harding Park seemed unrealistic and far fetched, Sean Elsbernd, Tony Hall's Chief of Staff helped to revive the project. He was the one who later succeeded Hall. He and Tatum convinced Hall that the renovation could be a significant revenue producer for the city, by attracting the PGA Tour back to town. They thought it would provide the adequate stimulus for the city to move forward. They also addressed funding concerns by tapping grant money from Proposition 12, a measure passed in 2000 to fund parks across California. But advocacy groups such as the Neighborhood Parks Council continued to oppose the project, claiming that renovating the golf course was not a priority for the city, and that those state grants should be used to help improve other recreation facilities across town. Despite of opposition, the San Francisco Board of Supervisors unanimously passed the resolution to use Prop. 12 money in 2001, citing potential revenue for the city, should Harding become a regular host of professional golf events. Renovation finally began in the spring of 2002. The 15-month-long project expanded the course from 6,743 yards (6,166 m) to nearly 7,200 yards (6,580 m) in length, and upgraded the driving range and clubhouse to PGA Tour standards. The course property remained under the ownership of the city and county of San Francisco. The city's parks and recreation department is responsible for course maintenance, which remains an ongoing concern, for everyday players as well as for PGA Tour officials looking to conduct future events at the course. Before the 2010 deal with the PGA Tour that made Harding Park a member of the TPC network, Kemper Sports operated the course, including the pro shop and tee-time reservations. Following the deal, which lasted through the spring of 2010, the course is now operated by the tour's Golf Course Properties arm for no management fee. Facilities have become world class and include a modern clubhouse and restaurant capable of hosting special events, and a full-sized practice range. The renovation budget also covered the park's picturesque and challenging nine-hole layout, The Fleming 9, named for John Fleming, the long-time San Francisco Park's superintendent. The fee schedule includes a substantial discount for San Francisco city residents, and a smaller discount for residents of Bay Area counties. On October 6, 2005, Harding Park hosted the WGC-American Express Championship, its first PGA Tour event since 1969, drawing top golfers such as Tiger Woods and Phil Mickelson from around the world. In a thrilling finish, Woods outlasted John Daly, when Daly missed a short par putt on the third hole of a sudden-death playoff. Over the next ten years, several more PGA Tour events are scheduled to be hosted at Harding Park, according to an agreement between the city and the PGA Tour. The course hosted the WGC-Cadillac Match Play in 2015, and will host the 2020 PGA Championship. Harding Park is also scheduled to host the 2025 President's Cup. Harding Park hosted the Champions Tour's season-ending Charles Schwab Cup Championship in 2010, 2011, and 2013. The tournaments were respectively won by John Cook, Jay Don Blake, and Fred Couples. Harding Park has been chosen to host the PGA Championship in 2020,  the first in the western U.S. since 1998. ^ "Scorecard" (PDF). TPC Harding Park. Retrieved August 5, 2014. ^ "Course Rating and Slope Database: TPC Harding Park - tour tees". USGA. Retrieved August 5, 2014. ^ "Harding Park". SF Recreation and Park. Archived from the original on 2010-07-07. ^ a b c d Elliott, Cindy (November 3, 2010). "Harding Park completes rebound by joining TPC network". PGA Tour. ^ Kroichick, Ron (October 2, 2005). "Reinventing Harding Park: Can the everyman course be as glam as Pebble Beach?". San Francisco Chronicle. ^ Garcia, Ken (December 7, 2001). "Bringing Harding Park Golf Course up to par". San Francisco Chronicle. ^ Murphy, Brian (August 23, 2003). "Mayor Brown leads opening". San Francisco Chronicle. ^ Spousta, Tom (October 6, 2005). "San Francisco course no longer below par". USA Today. 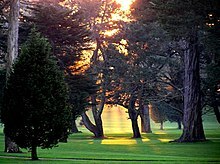 ^ "Harding Park to Host Future Tour Events". PGA Tour. Archived from the original on 2011-06-04. ^ "Tournament Information - The Presidents Cup 2009, Harding Park Golf Course, San Francisco". Archived from the original on 2009-06-28. ^ a b c "Match Play gets new format for '15". ESPN. Associated Press. July 2, 2014.